Aphrodite DeVine is a curvy pocket venus with the heart of a stripper and the soul of a clown. Her Burlesque is like a generous cupful of hot cocoa: Super sweet & steaming hot, with just that cheeky amount of fat! As founding member of southern Germany´s pioneer burlesque troupe "The Filly Follies", Aphrodite DeVine hilariously strips on stage since 2008. 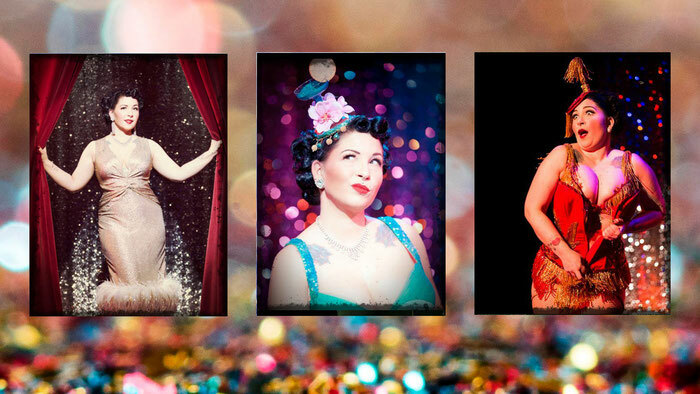 The Filly Follies are the producers of the very successful "Velvet Voyage" variety show series in Munich and in their 10th anniversary year they decided to bring a new Burlesque Festival to Munich, together with Bettie Berlin and Melody D'Amour. Since 2013, Aphrodite DeVine also travels the world with her special brand of burlesque: From Rome to Stockholm, from New Orleans to Warsaw, the audiences adore Aphrodite DeVine, "The Cheek Goddess of Burlesque"! Can love be a sin? Never! 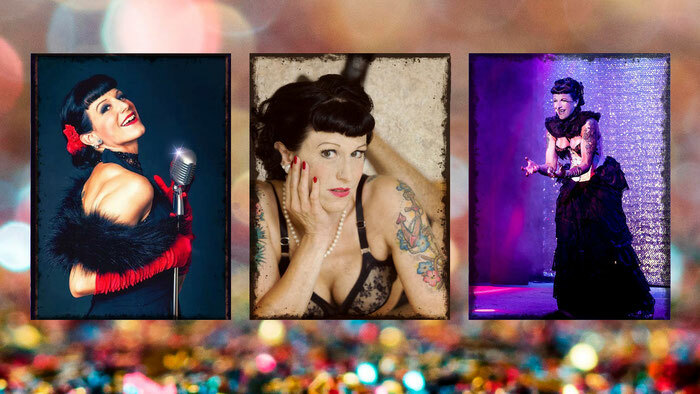 Bettie Berlin, the Femme Fatale, with a charming weakness for all matters of love, enchants with the zesty songs of the 1920's to 1950's. 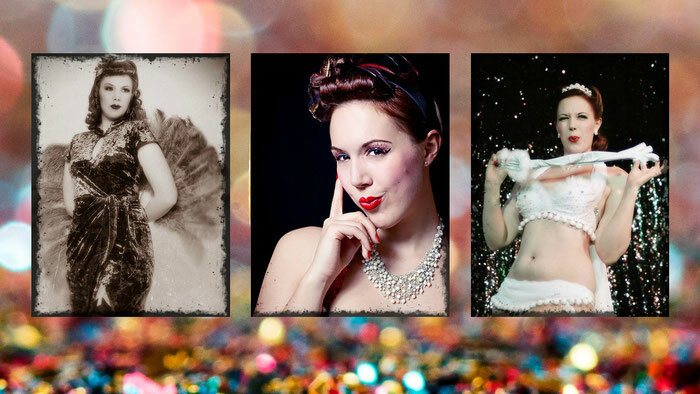 She skilfully combines burlesque, cabaret and vocals into frivolous acts. Singer, performer, host, special interest model and producer: Bettie is real multi talent. Currently she sings, performs and hosts her soloshow "Liaisons & Lieblingslieder" and produces the burlesque-music show "Una notte frizzante"
ChiChi Bouvet is an elegant femme fatale always surrounded by a breeze of glitz and glamour. With her breathtaking costumes and irresistible showgirl charme she brings the air of Moulin Rouge to theatres all around Europe. 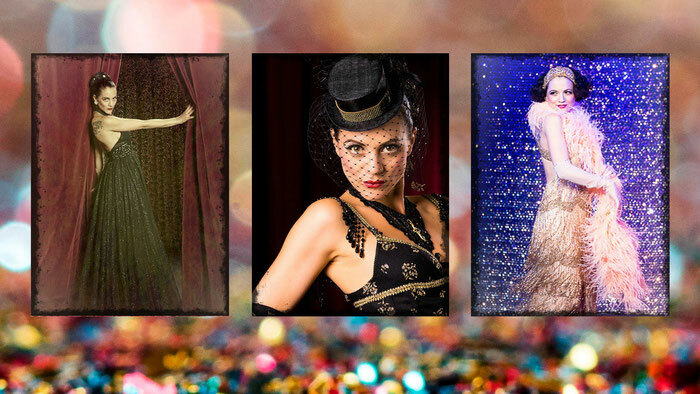 Chi Chi Bouvet is Co founder of the Munich based Filly Follies who produce the Velvet Voyage Burlesque Revue since more than 10 years. Be pleased to be teased by the Sensual Seductress of Burlesque - Chi Chi Bouvet. Diva Desaster is a pioneer of the Munich Burlesque scene specialising in neo-classical performances and founding member of the successful troupe „The Filly Follies“. 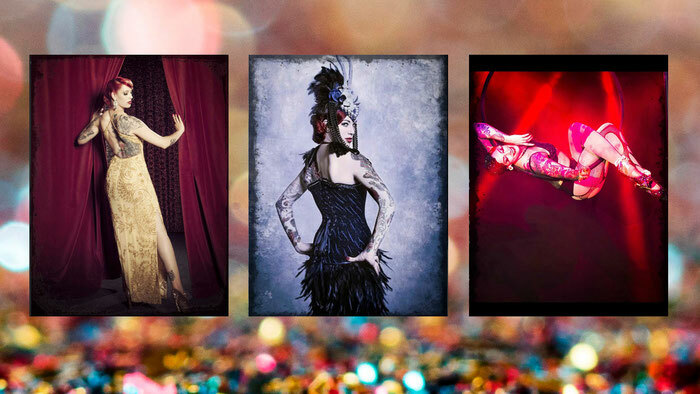 Together with The Filly Follies she promotes Munich’s most renowned and longest running Burlesque Show “Velvet Voyage” featuring the top of the crop of international performers. Since 2009 she has gripped the audience across European stages such as the renowned London Burlesque Week and the Milan Burlesque Award with her electic mix of glamour and fiery Rock'n'Roll. She takes great pride and joy in hand-making her costumes herself. Melody D'Amour! True to her name she brings her love of music to the stage. Sometimes funny, sometimes classic, sometimes surprising: her shows are as diverse as she is. Melody is an actress, a Pin Up Model and currently learning to play the Ukulele. 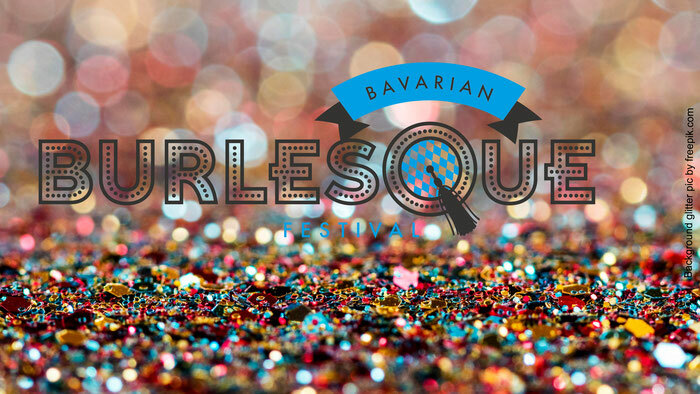 Besides producing the Bavarian Burlesque Festival, she is succefully running the "Revue Palais" and performs across Europe.